I finally made myself make a quilt top. I still haven’t found my sewing mojo, so I thought maybe if I made myself sit in that chair and sew something it was sure to come back. And I think it did…a little at least. This wonky block quilt top resulted from an afternoon of sewing, and although it wasn’t the original plan for this fabric, I really like the way it turned out. Its a nice overcast day here so we made our way downtown Poulsbo this morning to the farmers market and to the quilt shop to pick up this cute backing fabric. And no stop downtown is complete without a stop at Slys Bakery, where I pounded a chocolate donut the size of my head. I acted like I was going to share it with someone so I didn’t look like such a horker, but I’m pretty sure they saw straight through that one. Fabric is by Allison Jane Smith for Windham Fabrics. The whole line is cute cute cute. That backing fabric is a must have for my son – can you explain that to my husband? Slys is sooooo good isn't it – I need to head to Poulsbo again to shop at the quilt shop and of course have donut at Slys. Your quilt is awesome too. You inspire me to get something done for my boys..they just got new beds, so over course they need new quilts now ! it did come out very nice. glad you are getting your mojo back. LOVE LOVE LOVE your offset blocks. I saw them on your Wonky block and was inspired to use this concept when creating my new Hats Off to Christmas table runner! Thank you for the inspiration! love it! and the chocolate donut story made me laugh, it is so something I would do! I'd have to say it MUST be back, that top is adorable! It is SOOO GOOD to see your quilting again! I really like this one! those teeny tiny cars are killing me! FABULOUS quilt top. consider your sewing mojo FOUND! I'm headed for Port Townsend next week for a vacation. I think I will have to make my way to Poulsbo and Slys! this one might be one of my favorites! it's so simple, yet so sweet. good luck keeping your mojo goin! Mojo seems happy to me. A lovely little quilt for some lucky little car lover!!! So cute! I love how nicely the fabrics play together. Love the quilt top. It sure looks like the mojo might be back. 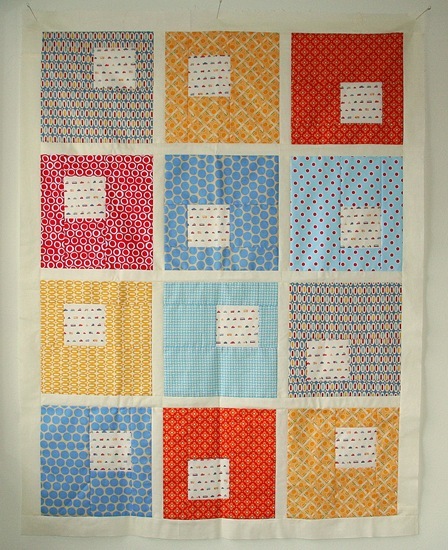 Love the quilt top & the backing fabric you chose, beauitful work. Those fabrics are gorgeous and the quilt top's too cute!! I think the quilt top looks great! It's going to be a lovely quilt. That is great fabric. I LOVE this! The pattern is so fantastic! I am very modern and I've been wondering if there are any good, simple, square quilt patterns out there and this is fabulous! Looks soooo good! Love all the fabrics. 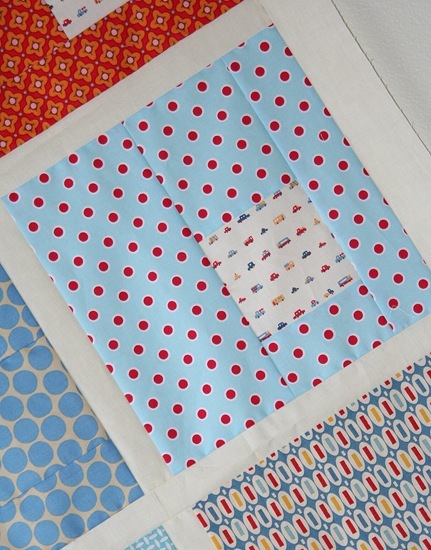 The bubblegum basics blue and red dots are super cute…I haven't found any yet! that is a fun quilt top! love this quilt and your fabric choice.